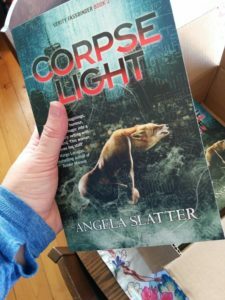 The lovely folks over at Tor.com have the opening chapter of Corpselight over on their site for you to read! She took a while getting out of her car, smoothing the workday creases from her Donna Karan suit, collecting her handbag and the briefcase. She jingled the keys before inserting them in the lock of the house’s front door, as if the noise might ward off evil spirits; as if it might let them know she was home and they should disappear. The hallway looked fine, but the smell hit her before she’d taken even two steps inside. Had she caused it, she wondered, with her expectation? She shook her head: magical thinking would get her nowhere. Steeling herself, she followed the stench. This entry was posted in fairy tales, News and tagged angela slatter, Corpselight, hachette australia, jo fletcher books, tor.com, urban fantasy, verity fassbinder. Bookmark the permalink.